What is the risk of a single skydive? So, how much is the risk of a single jump? How does that compares with a common activity like driving a car? According to the United States Parachute Association (USPA), there were 3.2 million jumps in 2016 and 21 fatalities. 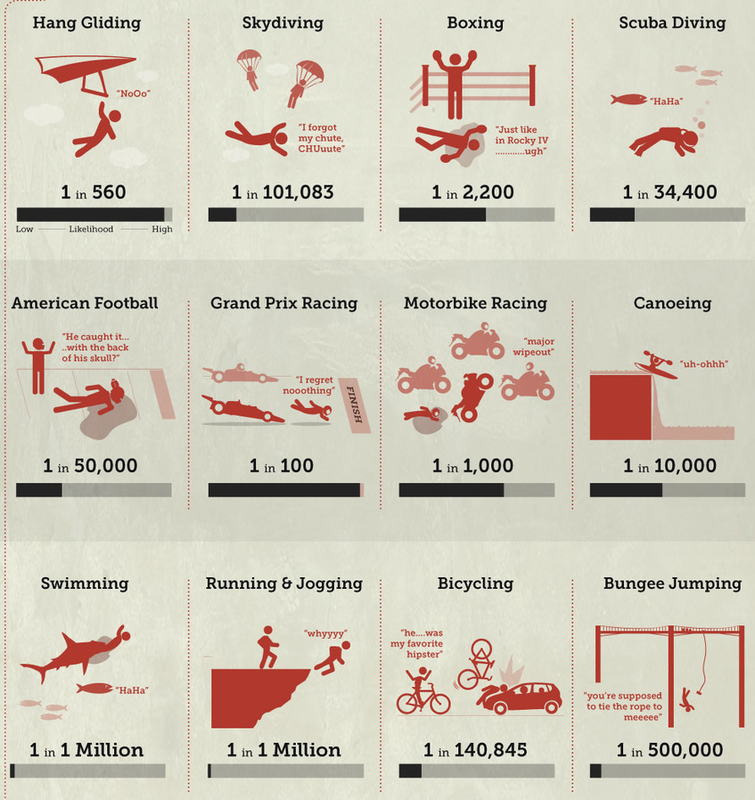 Therefore, the chances of dying in a single jump were 1 in 152,381. For a comparison with driving, we can use data from the Insurance Institute for Highway Safety. According to which, in the United States there were on average 1.16 deaths per 100 million vehicle miles traveled. Crunching those numbers, the chances of dying by driving one km are 1 in 138,103,448. Therefore, to equal those chances to one skydive you have to drive 906 km. In 2016, a single skydiving jump in the US represented the same risk of death as driving 906 km (566 miles). Many have pointed in that there might be an important component of the risk related with age, experience and how careful a skydiver is. To approach to an understanding in that regard I've compiled the 147 fatal accidents in the USPA database that happened from 2008 as a result of solo jumps (i.e. not-tandem). This data do not allow to infer real demographics trends, because I don't know how many total jumps were in each demographic group (I only know how many lead to a fatal accident). However, the visualization of some aspects of the data can be informative. 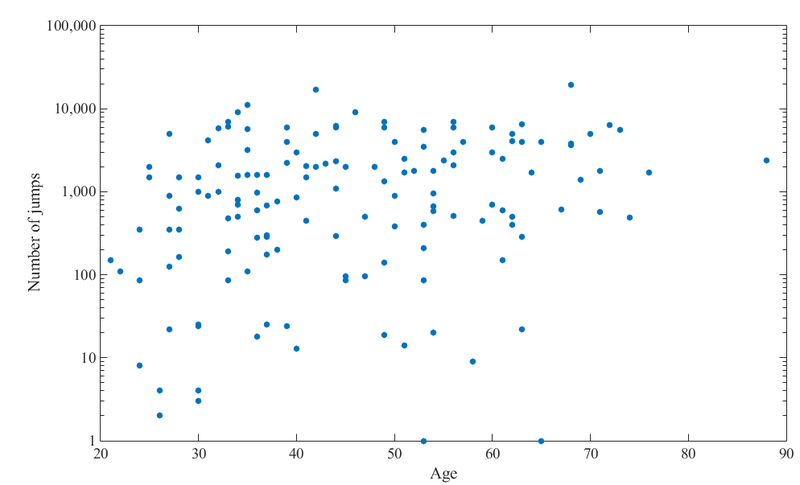 In the following figure each dot is a fatal accident, and it is plotted based in the numbers of jumps the person involved have performed before the accident (vertical axis) and the age of the person (horizontal axis). It is clear that the bulk of casualties happen to fairly experienced skydivers (100+ jumps). So, as expected, the more you jump the more chances of dying you have. Note that the vertical axis is logarithmic (so to distinguish between people with relatively small jump counts). In this plot, the first bar counts deaths during jumps 1 to 50, the second bar for jumps 51 to 100 and so on. So now it seems that most deaths are in the first 50 jumps. 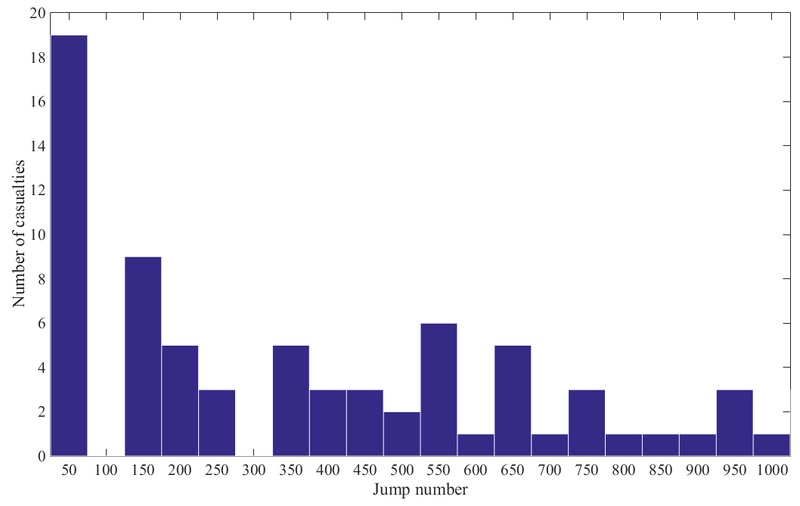 However, that does not mean that the first 50 jumps are more dangerous, because there were many more jumps corresponding to jump number 1 to 50 than jumps number 900 to 950. So, however informative, this have no real statistical value. And the trend suggesting that jumps become less dangerous as you gain experience might be just an artifact due to the fact that there are more beginner skydivers than experienced ones. Here is another way to understand risk perception in skydiving vs driving. In skydiving, equipment malfunction is the cause of 50% of deaths. The highly regulated automobile industry would never stand for this. It would be deemed unnecessary and engineered out of the products. Collisions, landing problems, and other account for the other 50%. In driving, almost none of the fatalities are equipment related as it doesn't even rate a one percent causality. Drunk driving, speeding, distractions and weather cause nearly all traffic fatalities. In other words, if you are a careful driver you can eliminate virtually all risk of death from your own driving. If you are a careful skydiver, at best you can only eliminate half the risk. My guess is that few skydivers jump drunk, or exhausted and just trying to get home, or in a downpour. The 900km risk comparison might be fifty times too generous when applied to conscientious people, which I would assume skydivers already are. 45,000km might be more reasonable given the <1% vs 50% equipment failure ratio, and this is more than two years of driving for the average person. This is also more in line with general perception of risk. You jump with a main chute and a reserve chute. The odds for either one of these failing are roughly 1 in 1000. This give approx a 1:1,000,000 chance both fail and you fall to your death. Not the answer you're looking for? Browse other questions tagged safety skydiving or ask your own question. What happens if a parachute does not open while skydiving? How does one launch unmanned high-altitude balloons without posing a safety risk to aviation? What is the maximum altitude a skydiving plane can fly? What is the purpose of D-Bag in skydiving parachute? What steps can pilots take to mitigate the risk of controlled flight into terrain (CFIT)?